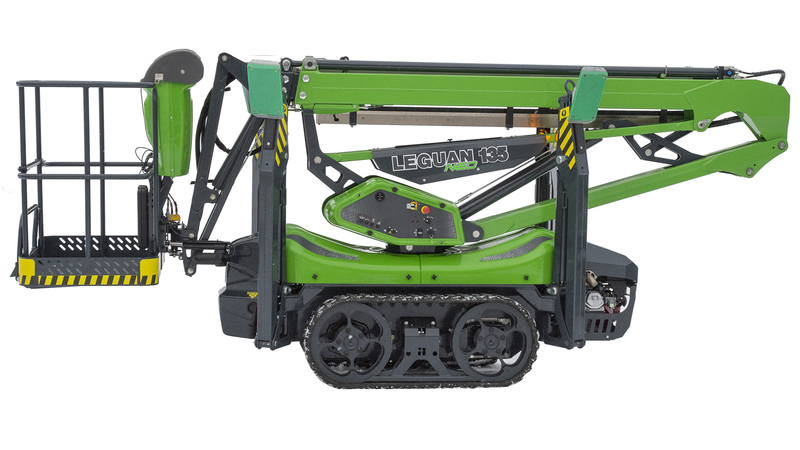 Leguan 135 NEO is the newest member of the Leguan product family. 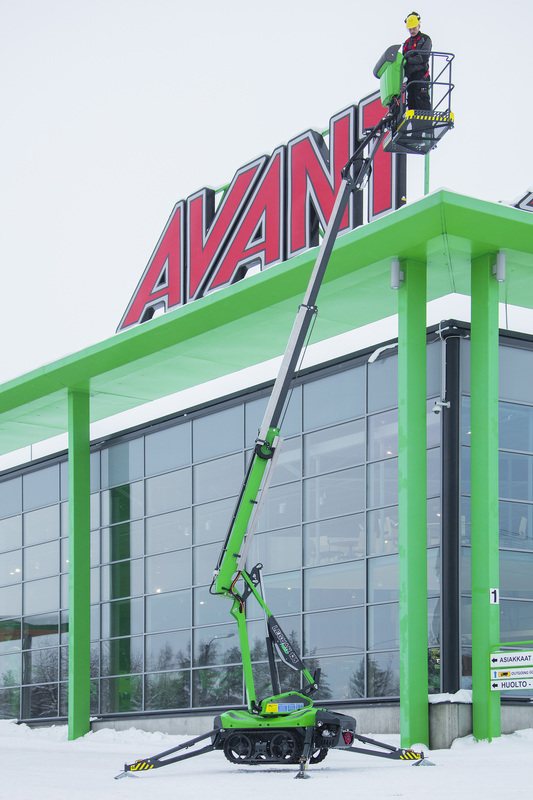 It is based on an inventive new patented telescopic boom structure. 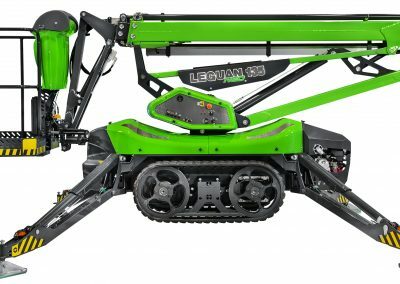 NEO represents a new generation of Leguan access platforms, which combines user-friendliness, large working load and reliable technology. 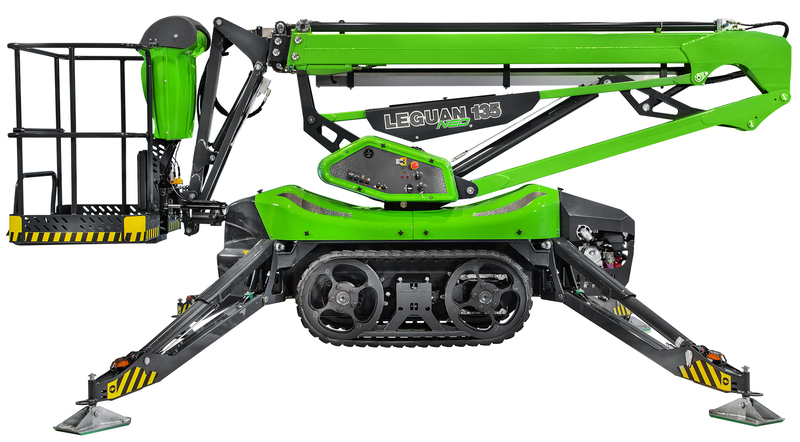 135 NEO is the first joystick operated access platform from Leguan. 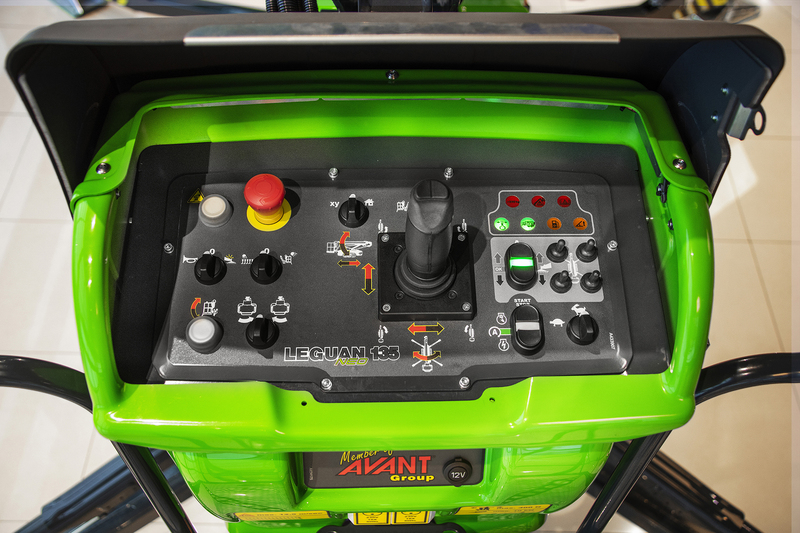 Controlling the machine with a joystick makes it easy to perform multiple boom movements at the same time with just one hand on the controls. Automatic levelling makes setting up the platform quick and effortless: Automatic levelling works with just a single push of a button. Levelling works quickly and accurately even on sloped surfaces. 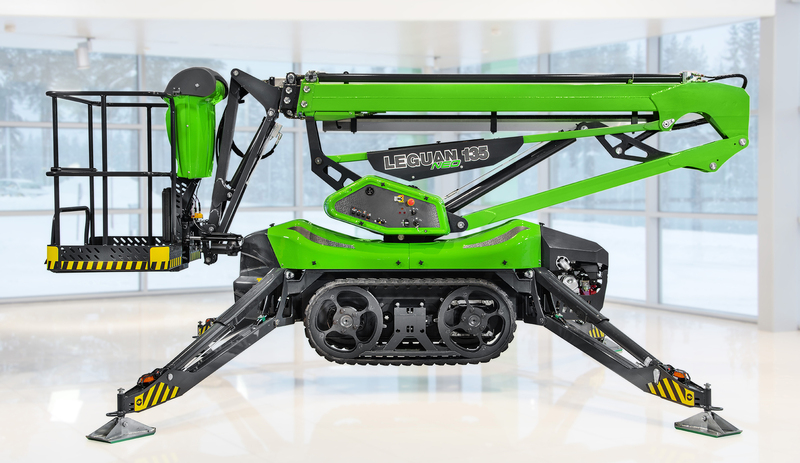 With the 135 NEO Leguan also introduces new ingenious functions: Work platform’s horizontal and vertical wall tracking with the XY-function and Home-function, which moves the booms to transport position autonomously. These user-friendly functions are sure to attract even the most demanding users. The access platform comes equipped with a lot of great features as standard, like lower controls and electric emergency lowering. 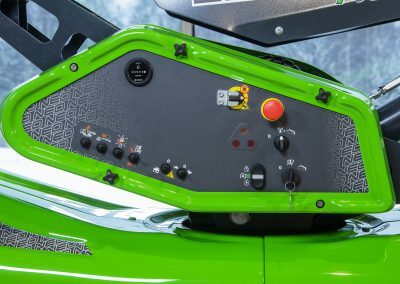 With optional features you can add a lot of helpful tools to make the platform even better, such as powerful LED-work lights or a track chassis. 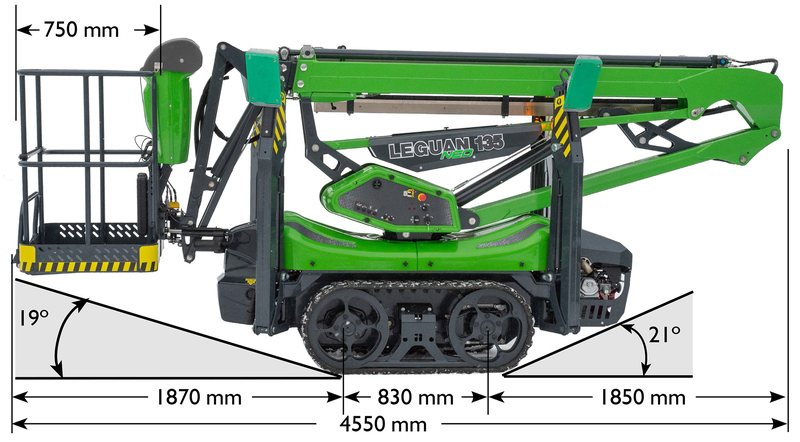 Leguan 135 NEO is the first telescopic boom lift from Leguan. The booms are strong and solid, which allows a large 250 kg (551 lb) platform load with 6.6 meters (21 ft 7 in) outreach. 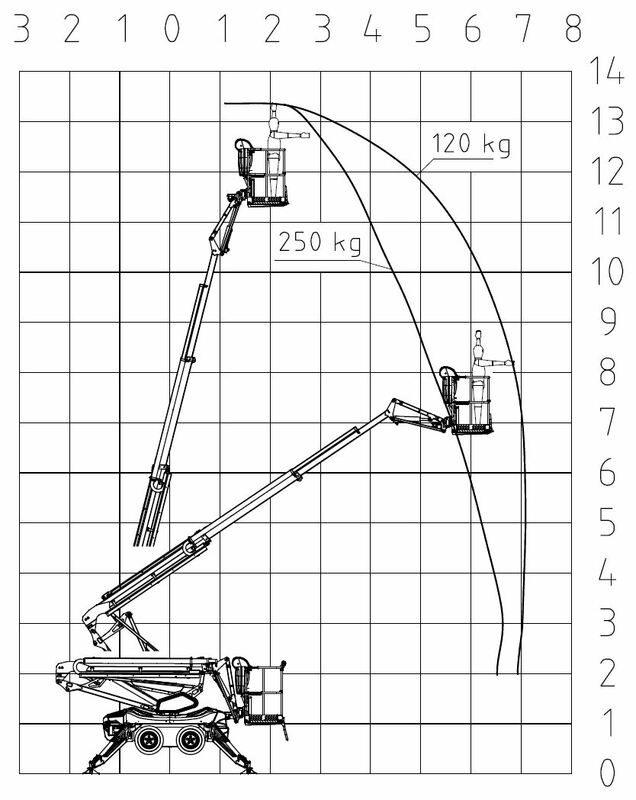 You can reach up to maximum outreach of 7.1 meters (23 ft 3 in) with a hefty 120 kg (264 lb) platform load. 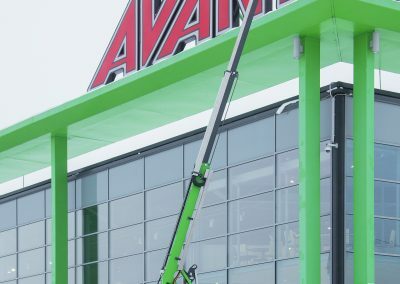 Maximum working height is 13.4 meters (43 ft 11 in) with the maximum platform load. 135 NEO weighs only 1630 kg (3494 lb), which makes it a top performer in its weight class. 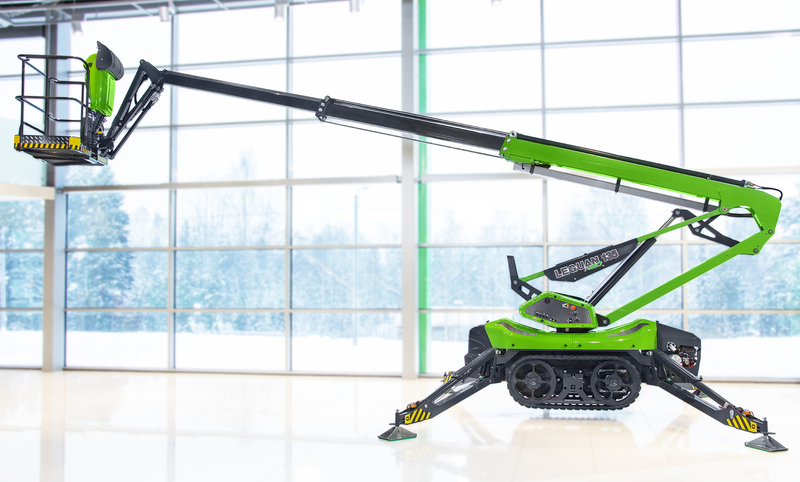 The key qualities in designing the 135 NEO were light weight and narrow chassis to make it easy to transport and great tool for working indoors. The access platform is only 0.89 meters (2 ft 11 in) wide (without work platform) and only 1.93 meters (6 ft 4 in) in height so it fits through a doorway. The work platform is quickly removable without tools and it takes only a few minutes to remove and reattach. There is also a tailormade trailer for the 135 NEO. The combined weight is only approximately 2000 kg (4409 lb) so it can be towed with most vans and many cars as well. It is also possible to use the platform on the trailer, so you can quickly move from one work location to another. 135 NEO comes with a Honda petrol engine as a standard. The engine is equipped with an automatic revolution adjustment and choke, designed by Leguan. The engine is quick and easy to start with just a single push of a button. As an option you can get an electric motor (230 V / 16 A, or 110 V / 32 A) to operate the access platform. Using the platform with the electric motor makes it emission-free and very quiet to use indoors and outdoors. All the platform’s functions can be used with both petrol engine and electric motor. 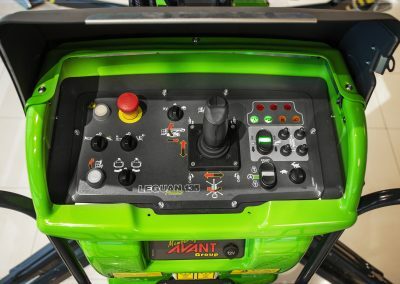 A battery powered version of the Leguan 135 NEO will be introduced later in 2019. 135 NEO performs extremely well on tougher terrains as well as indoors. You can get the 135 NEO with either four-wheel-drive or with a rubber track chassis. Both wheel-based and track based models can handle tougher terrains brilliantly. The advantage with the track chassis is lower pressure applied on the driving surface, which makes it easier to move around on softer ground, like on sand or even snow. Non-marking tyres and tracks are also available, so you don’t have to worry about leaving black marks behind on delicate surfaces. Leguan really shows its versatility in different stages on the building site. Thanks to the intelligent boom design the outreach is excellent. You can get to the very difficult-to-reach places quickly and safely. The Leguan works well both in outdoor and indoor use. All works related to building - erecting the framework, installation of air conditioning, plumbing and electric appliances, masonry, plastering, interior construction and painting – are the specialities of the Leguan. The same features as in construction are important in industrial maintenance as well. Fast and easy transportation, dual propelling system with combustion engine/electric motor and excellent outreach make Leguan the right choice for many different industrial maintenance jobs.